If you are a fan of Torque style bangles, then you will love the Eva Square Torque! It is a fabulous, highly polished sterling silver torque bangle which has a lovely, weighty feel to it. With it's stunning square section design, the ends of the torque have been flattened, which makes this torque extremely comfortable to wear. The Eva Square Torque is a simple yet elegant bangle, with it's sharp edges and polished design it is still very much a beautiful, feminine bangle! 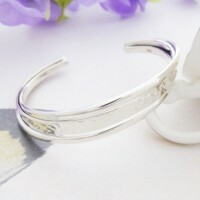 This bangle is hallmarked and made out of quality 925 Sterling Silver. It measures approximately 6cm in diameter and 4mm thick. It is an open bangle and is it suitable for most women's wrists.